The president said there is a "less than 50-50" chance negotiators reach a deal. With less than three weeks for the White House and Congress to negotiate a compromise on border security funding, at the moment, President Donald Trump has said he has little confidence the job will get done in time. The president gave the bipartisan group of lawmakers a “less than 50-50” chance of crafting a deal in an interview on Sunday with the Wall Street Journal, setting up what could be another government shutdown. If no deal is reached, the president has threatened another shutdown or to use executive powers to declare a national emergency – a move that some Republicans have warned could set up a bad precedent. The White House was quick to try to paint the president’s unexpected capitulation on Friday as a victory. It came after the president presented a week before what he described as a “compromise” that would fund the border wall and provide temporary protections for "Dreamers" -- undocumented immigrants brought to the U.S. as children -- and those with temporary protected status, including victims of natural disasters. But Democrats wouldn’t agree to the president’s proposal. 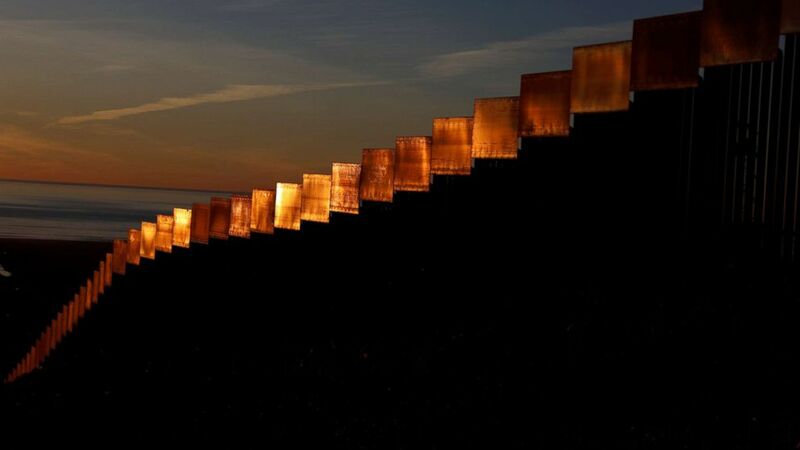 (Shannon Stapleton/Reuters) The U.S. and Mexico border fence is seen in Tijuana, Mexico, Jan. 27, 2019. Now, the president has ruled out striking a broader immigration deal that might include a path to citizenship for Dreamers in exchange for border-wall funding or settle for anything less than the $5.7 billion he originally requested. In her first on-camera press briefing in 41 days, White House Press Secretary Sarah Sanders was asked if the president was really ready to endure yet another shutdown. Talks among Republicans began after the president signed a bill to reopen the government on Friday night following the longest government shutdown in American history. On Friday night, Senate Republicans – including Sens. Shelley Moore Capito of West Virginia, Kevin Cramer of North Dakota, James Lankford of Oklahoma, Joni Ernst of Iowa, Portman of Ohio, and David Perdue of Georgia -- met for a private meeting with acting chief of staff Mick Mulvaney to begin hashing out a game plan for negotiations. Trump called into the meeting, according to a GOP aide. Despite the president’s comments to the Wall Street Journal on Sunday, the White House said the president wasn’t pouring cold water on the negotiations by already dangling a national emergency. “I think that he is seeing the negotiations for what it is, this is an opportunity for Congress to act. It's an opportunity for Congress to speak with the experts -- the president has listened to these experts in the Border Patrol community to figure out what are the resources we need to secure the border,” Mercedes Schlapp, White House Director of Strategic Communications, said Monday. Sanders told reporters that it will be up to the conference to handle negotiations and indicated that the White House won't even be sending a representative to negotiate on behalf of the president. Trump ally and confidante Sen. Lindsey Graham, a South Carolina Republican, has publicly urged the president to declare a national emergency if appropriations negotiations fail. “If White House and Congress fail to reach a deal then President Trump must act through emergency powers to build wall/barrier,” Graham tweeted. “Presidents Bush, Obama, and Trump have all sent troops to help secure the border in the past. If White House and Congress fail to reach a deal then President @realDonaldTrump must act through emergency powers to build wall/barrier. What’s the difference between troops securing the border and troops constructing barriers to secure the border?” Graham asked. Still, he said he is “hopeful” Congress and the president reach an agreement. Sen. Marco Rubio, R-Fla., called the idea of declaring a national emergency a “terrible” idea on NBC's "Meet the Press" Sunday citing potential legal issues and the precedent that it sets. “It doesn't mean that I don't want border security. I do. I just think that's the wrong way to achieve it,” Rubio said. Democrats have indicated that if the president were to pull the trigger on a national emergency declaration it would trigger immediate legal challenges. Some legal experts argue the president has already undermined his authority to do so by continuing to delay amid the negotiations. But Sanders insisted the president is merely hoping to exhaust all possible legislative options before taking that step. ABC News' John Parkinson and Alexander Mallin contributed to this report.